Designers constantly struggle with the task of creating successful content pages. 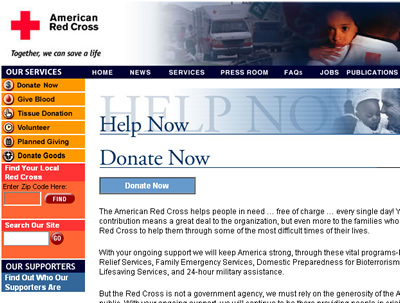 For example, RedCross.org’s designers need their users to understand all the options for donations. When the world faces a major disaster like the South Asia tsunami, the designers want users to realize the flexibility they have to help. A simple usability testing technique can help design teams quickly measure how a content page performs with users. We call it the 5-Second Test. As the name suggests, the 5-Second Test involves showing users a single content page for a quick 5 seconds to gather their initial impressions. Five seconds may not seem like a lot of time, but users make important judgments in the first moments they visit a page. 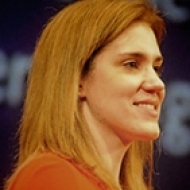 This technique unveils how those judgments turn out, giving the team insight into some essential information about the page. Using this technique, we’ve found the information we’ve gathered essential for making huge improvements to our clients’ sites. If you’ve conducted a usability test in the past, it’s very simple to put together a 5-Second Test. It has a similar structure to traditional usability tests—you’ll have users, tasks, and the site you’re testing. The difference is in the specific protocol for running the test. Figure 1: The Red Cross.org’s Donation content page needs to communicate to users all of their contribution options. You’re ready to donate to the Red Cross organization. But you’re unsure of what kind of donation to make. What are your donation options? Next, before we show the user our page, we tell them we’ll only display it for 5 seconds. We ask them to try to remember everything they see in this short period. By paying careful attention to users’ initial impressions, we can identify whether the content page is clear and concise. If the page is understandable, users will easily recall the critical content and accurately identify the page’s main purpose. In our test of the Red Cross page, all users could tell us what content was most important—they all told us the purpose of the page was to generate donations. However, the page was surprisingly ineffective at communicating the donation options. When prompted, users told us they knew they could donate money to the Red Cross. What they didn’t learn was that they could also donate stock, clothes, and airline miles. Even though this information was readily available on the content page, no user realized there were other options. We learned the content page was not doing its job communicating all of the relevant information. To succeed, the team needed to highlight the different vehicles for donation better. Recently, we repeated the test on a redesigned version of the Donation page. (Figure 2) This new page prominently lists all of the different ways of donating at the top of the screen. Testing the redesigned page, we found users readily recalled the complete set of donation options with only 5 seconds to look at the page. Figure 2: With the redesigned version of the Donation content page, users readily recalled the complete set of donation options with only 5 seconds to view the page. Limiting the viewing time to 5 seconds, we get a valuable glimpse into what happens during the first moments a user sees a page. When we give users more than 5 seconds to study the page, we’ve found they start looking at the page more like a designer, noticing details they would normally miss or misinterpret. Frequently, we’ll conduct 5-Second Tests with paper mock-ups or low-fidelity electronic prototypes, such as PDFs or Photoshop page renditions. We can test very early in the development cycle, long before the team builds a functional web site. Often, this early insight can help point out site-wide information design requirements, saving much redesign work down the road. One of the 5-Second Test’s biggest advantages is how quick it is. When evaluating the Donation page, each user took only 10 minutes! Because this technique is quick and easy to implement, it is perfect to run in locations where we can gather many users at one time, such as trade shows, conferences, and the company cafeteria. We can gather large amounts of user data in a short time. We’ve found this technique to be an essential part of our usability toolbox. However, it has limits to what it can tell us. We’ve found the technique is best when we use it on pages designed with a single primary purpose. Home pages and major navigation pages don’t yield as valuable results, because they often serve many different tasks. 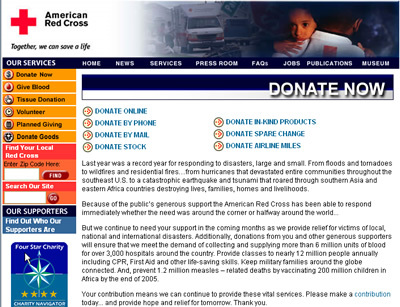 For example, the home page for RedCross.org serves the needs of donors, sponsors, volunteers, medical professionals, victims, and the press, each with their own set of tasks. Each of these different users would probably see different things on the page, depending on their context and immediate goals. Other techniques, such as traditional usability tests and inherent value tests would be better instruments for judging the effectiveness of this page. We’ve used 5-Second tests on any project where clients need to make quick improvements to their content pages. If you have a site or product where users tell you that the site’s content pages are cluttered or confusing, this may be just the right test for you. 5-Second Testing is one more technique in our user experience toolbox that gives teams the information they need to create successful designs. Published here on September 11, 2007.